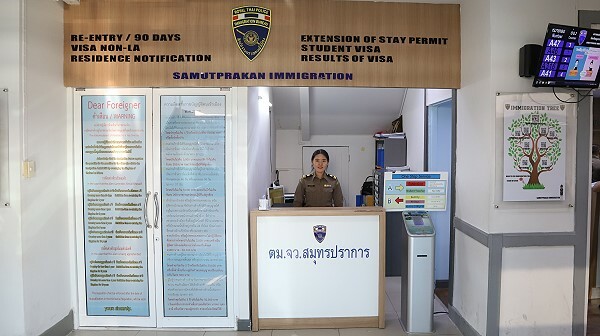 Welcome to the website for the Immigration office in Samut Prakan in Central Thailand. We are open from Monday to Friday. Opening hours are 8:30 a.m. to 4:30 p.m. We are closed for lunch break from 12:00 p.m. to 1:00 p.m. Please note, the queue number system may be switched off at 3:30 p.m. on busy days. 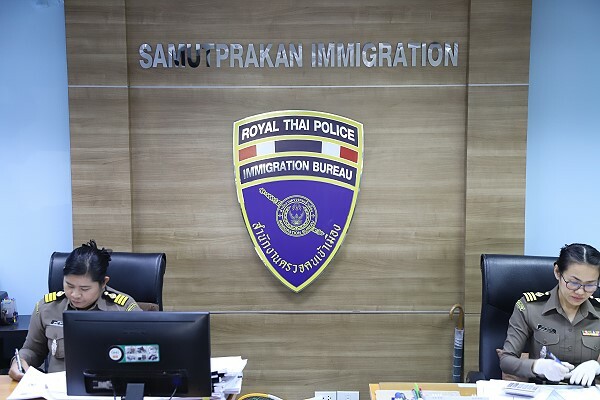 UPCOMING HOLIDAYS: Samut Prakan Immigration will be closed on these dates: 18th February (Makha Bucha Day), 6th April (Chakri Day), and 15th-16th April 2019 (Songkran). Q. Do I have to carry my passport at all times? A. Foreigners must carry their passport or a photocopy at all times. If they go away somewhere overnight, they should also take their passport. For photocopies, you need to show the photo page and the latest extension of stay. Violators could be detained and told to pay a fine not exceeding 2,000 Baht. Q. Does my Thai wife have to report my address to Immigration? A. Homeowners must inform Immigration within 24 hours if they have a foreigner staying at their house. This can be done using form TM30. This only needs to be done the first time. Homeowners face a fine of not exceeding 2,000 Baht while hotel managers could be fined 4,000 to 8,000 Baht. Click here for more questions. If you are inconvenienced in any way, please contact the superintendent of Samut Prakan Immigration on 02-395 0029 Ext. 12 or 14. 90 DAY NOTIFICATION: The office for 90 Day notification is now in the office on the left as you enter the building. You will find, that towards the end of the day it will be less crowded. If you have all your documents in order, you should be in and out within 5 minutes. You need to fill out the TM47 form and bring photocopies of the following pages in your passport. In addition, you may be asked to show proof of address. So, please prepare a photocopy of your house registration or rental contract. Front page showing name / surname / Passport No., etc. RE-ENTRY PERMIT: You need to fill out the TM.8 form. Then bring to the Immigration office your passport, a 4×6 passport photo and 1,000 Baht for single re-entry and 3,800 Baht for multiple entry. 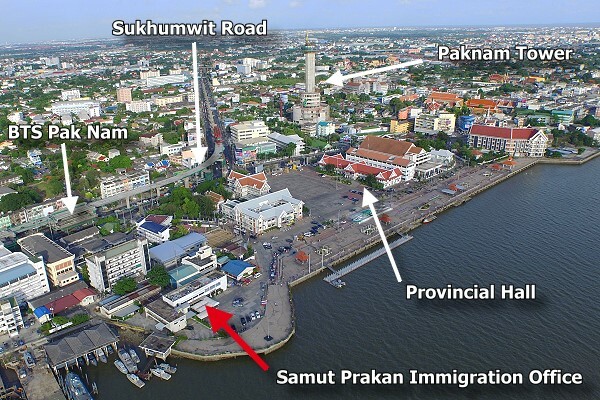 Samut Prakan Immigration office is on the waterfront in Paknam. 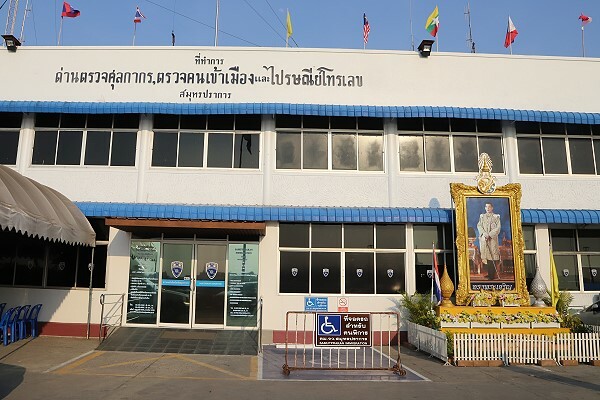 It is in the same area as the Provincial Hall, City Hall and Paknam Post Office. Click here for a map.